Non-avian dinosaurs and other mega-fauna of the Cenozoic era. All those awesome real-worl kaiju that disappeared at the K-Pg boundary. No, that's not the same as 'dinosaurs,' which includes birds, but does not include plesiosaurs, icthyosaurs, pteradons and other wonderful creatures too righteous to be denied attention, but if I'd called the quiz "Non-avian dinosaurs and other megafauna of the Cenozoic era" this quiz would probably be about as popular as my first one on the Batman tv series, which had like 9 players. Besides, I'm not sure I like your attitude, Mr./Ms./ips Syntax-head. We're having a friendly little trivia competition here. Oh, yeah, please forgive me for not italicizing species names. If there's a way to italicize in Alpaca questions, I don't know it. Jack Horner has proposed that a dinosaur named Torosaurus may not be a species at all, but the holes (fenestrae) in its face plate may merely be secondary sexual characteristics of mature adults of what well known late Cretaceous species? Barney is a dinosaur from our imagination. While he's insipid and cloying, one could reasonably argue that a sometime "sidekick" dinosaur on his show was even more treacly. 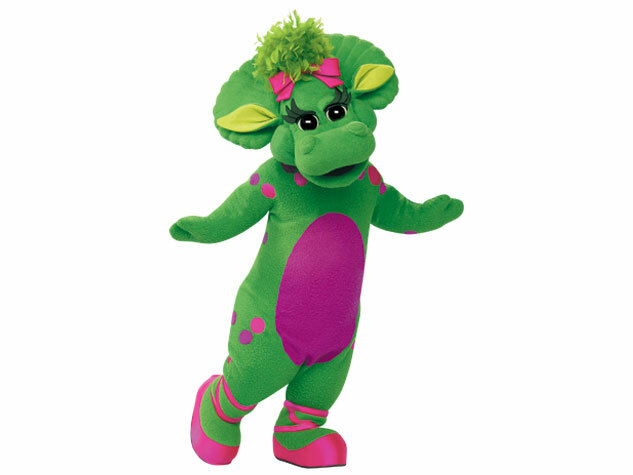 What was the name of this green and purple, INACCURATELY bipedal character? Oh, you want a picture? FINE. (looking for the CHARACTER'S name, not the species)? Among *known* species (obvy! ), the largest *terrestrial* species (specieses? speciesae?) to survive the K-Pg boundary belong to what highly successful order of wetland dwelling opportunistic predators? Snorkasaurus may not be found among recognized species per the Paleontological Society, but that's OK. We know that what animated purple pet was actually a snorkasaurus, no matter what they say? The year is 1923. Roy Chapman Andrews leads an expedition in the Gobi desert that finds fossils that shake the paleontologic world. What I read about in my elementary school days in the mid 1970's - that these fossils were Protoceratops - was amended in 1995 - they'd actually been looking at Oviraptors (a misnomer). In any event, though they had the species wrong, the contribution to dinosaur knowledge was enormous. Andrews et. al. with these misidentified little fossils, proved what? Marshall, Will and Holly, on a routine expedition, met the greatest earthquake ever known. They landed in the TV show "Land of the Lost," featuring Grumpy (a T. rex), Torchy (a Dimetrodon), Sleestak (bipedal lizards) and Chaka. Produced by Sid and Marty Kroft, the series was also largely created (and some episodes written) by David Gerrold, who wrote what episode of the original "Star Trek" series? Mary Schweitzer did some experiments with cross-sections of a femur, and, while scientists like to be parsimonious and conservative in their conclusions, TOTALLY SHOWED THERE WERE MALLEABLE PROTEINS IN THERE AND WE TOTALLY KNOW IT WAS DINOSAUR BLOOD!!!... Ahem. What species did Mary extricate viable proteins from? Never give up hope! It might be a real species after all! Othniel Charles Marsh once found a sauropod skeleton wanting a skull, found a Diplodocus skull a couple of miles away, and announced, "here's my new dinosaur!" Elmer Riggs said no, Othniel had the body of one known species and the skull of another. In 2015, a paper came out arguing that Marsh's discovery (the body portion) was in fact a distinct species. What is this beloved dinosaur, which also, according to a stone-age cook, is a great roast for dinner because "you have your meal, and there's enough left over for sandwiches?" The first clearly non-avian feathered dinosaurs were discovered in the 1990's in what modern Country? "Walk the Dinosaur" was a hit single in 1987 by what pop group, that no longer is?